These officers will serve a term of office starting immediately and concluding on June 30, 2019. The Master Executive Council (MEC) congratulates the newly elected officers and we sincerely thank all those who stepped forward to run in the election. As a reminder, AFA representation for Legacy Virgin America (L-VX) Flight Attendants will shift on August 1. LAX-based Flight Attendants will move to AFA Council 18, the currently established Local Council that represents Legacy Alaska (L-AS) Flight Attendants based at LAX. Going forward, AFA Council 35 will only represent SFO-based Flight Attendants. 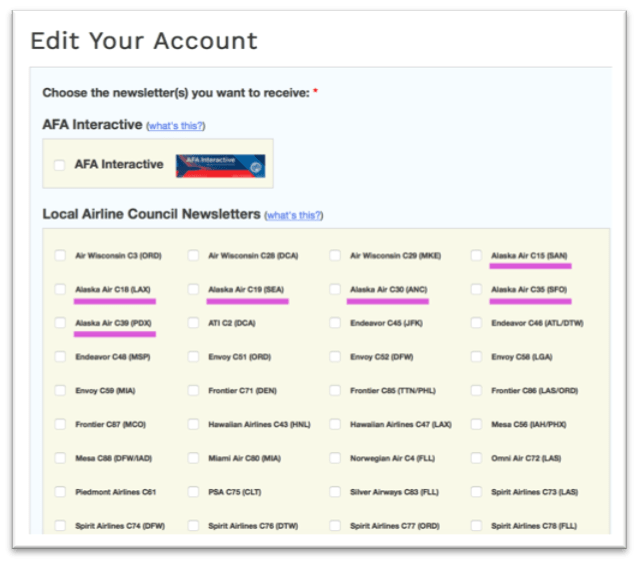 The AFA newsletter system allows Flight Attendants to manage their own account and subscribe to the AFA Local Council(s) of her/his choosing. L-VX Flight Attendants who are LAX-based might wish to subscribe to Council 18 AFA email newsletters to ensure that they receive correct Local Council emails and up-to-date information. Additionally, the manage subscription function can be used to make changes in the event of a base transfer. To manage your subscription, click “manage your subscription” link at the bottom of your email. To ensure security, this is the only way to access the subscription management page. Once on the subscription management page, check the box for the AFA Local Council(s) you would like to subscribe to emails from. At the bottom of the page are fields to update personal subscription information (name, email address, airline, base, and employee/PeopleSoft number). After making changes, click the blue “submit” button at the bottom of the page to save any changes. If you have any questions or need assistance with your AFA newsletter subscription, please contact your LEC Officers. If LAX-based, email lax@afaalaska.org; if SFO-based, email sfo@afaalaska.org. Big changes are in store for LAX! New service to Cuba. The introduction of “Premium Class” in 2017. The anticipated merger with Virgin America! Be a vocal part of that change by applying to be on the Inflight Service Committee.